Planetary props to the City of London for a monumentally memorable 30th Olympiad, viewed in this country against the backdrop of election-year coverage. It was obvious from the opening ceremonies that these would be games nobody would soon forget. From the queen jumping out of a helicopter to Charles Dickens wearing a top hat at Stonehenge contracting black-lung disease during the Industrial Revolution or whatever was going on there. Beautiful, is what it was. And odd. Then for two weeks, the world’s greatest athletes captivated global attention by setting records and shedding tears and pulling hamstrings in familiar events and sports we didn’t even know existed. Men’s rhythmic marathon gymnastic BMX diving? 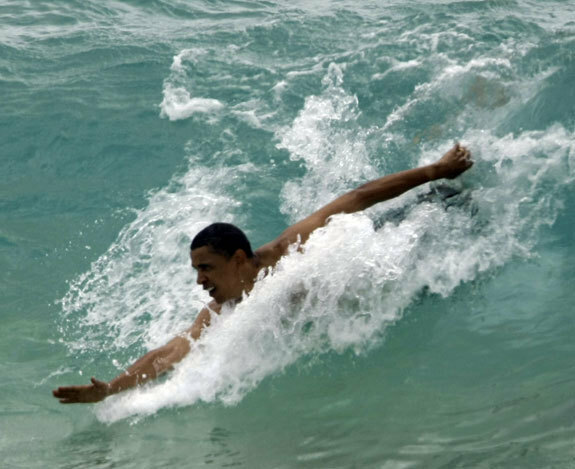 Keeping loose with some presidential body surfing in Hawaii. It continues to amaze how every four years, humans continue to incrementally evolve to be faster and stronger and higher and longer and as far as synchronized swimming is concerned, creepier. The weather was oh-so-British; mercurial, unpredictable and tipsy by dark. And added kudos must be laid at the feet of England’s capital city for keeping the contests pretty much controversy-free. Except, of course, the momentary ugliness that was the women’s semifinal field hockey match between Great Britain and Argentina. AKA: The Falklands War II. This time it’s personal! Utilizing less-lethal sticks. 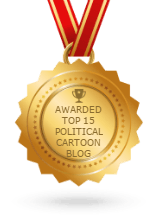 One can never entirely keep politics out of games or games out of politics. The two have too much in common. For instance, we cheer for our team no matter what opponents they line up against. And if a player switches sides, that’s fine too. As long as they wear our uniform. So essentially, what we root for is laundry. Score is kept and grudges held for generations. Contestants blindly resort to any strategy within the law to win, often finding themselves on the wrong side of strictly legal. And invariably one over-caffeinated idiot will try to psych out the other side with smack talk about somebody’s mama. Every once in a while some underused substitute will buzz a high, tight one under the chin of an opposing superstar and both benches will clear. And then… not much of anything happens. Participants talk of sportsmanship being the paramount goal but it’s plain to see everything is all about the gold. Even our notoriously composed to the point of semi-somnambulant president occasionally is forced to engage in various sporty contortions. We’re used to seeing him body surfing and on the basketball court, but the Complying Hawaiian has been showing off some pretty impressive election-year moves as well. As a little something we like to call the Barack Obama Election-Year Decathlon will elucidate. #1. The Individual Medley Multiple Issue-Straddle. #2. The Debt Ceiling Crisis Crunch Clean and Jerk. With an emphasis on the jerks. #3. Global Goodwill High Nuclear Hurdle Tour. #4. Extreme Middle of the Road Straightline Walk-Run. #5. Single Weekend 10 State Promise Them Anything Fundraising Marathon. #6. Last Minute Digging Up a Democrat with a Backbone Desperation Relay. #7. The Incredible Disappearing Successful Solar Energy Photo-Op Sprint. #8. The 800 Pound Gorilla that is the Economy Greco-Roman Wrestle. #9. Biting His Tongue While in the Presence of John Boehner Freestyle. #10. The Joe Biden Advanced Obstacle Course. Now with Landmines!